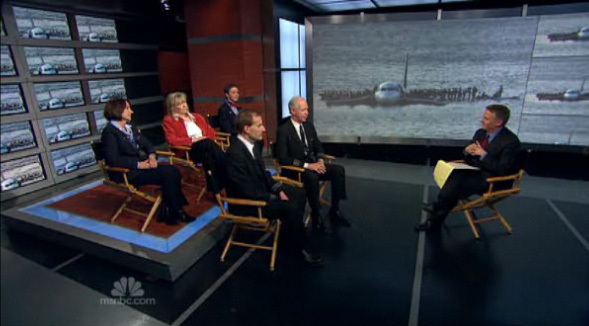 “NBC Nightly News” featured an in-studio interview with the crew of the U.S. Airways Flight 1549 last night. 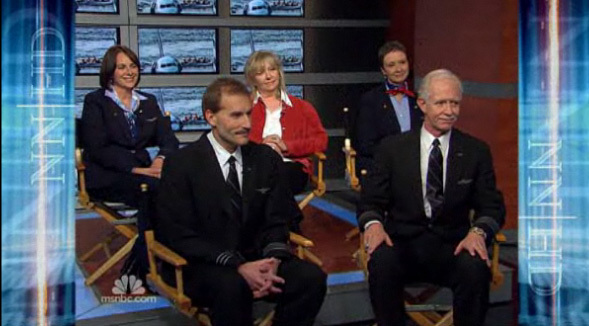 Producers set up aviation correspondent Tom Costello and the interviewees to the left of the studio’s main rear projection screen. Crew members set on a riser with Costello perched on a director’s chair down on the floor. The main rear projection screen and the array of smaller flat panels built into the wall featured looping video of the plane. This was an interesting use for this little-used area of the studio (it’s normally only used for the “Making a Difference” segment sponsor billboards). It would be nice to see “Nightly” use this area bit more. 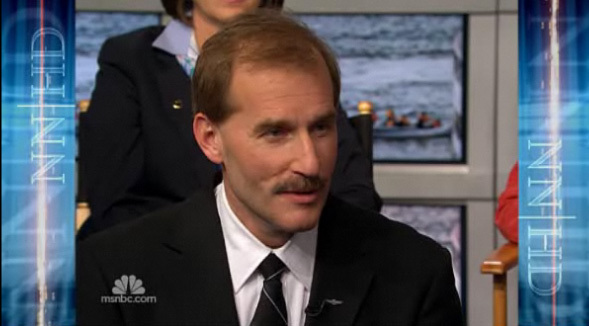 Personally, I wasn’t a fan of the chair selection; the light wood material stood out like a sore thumb and some of the ultra modern black chairs used on the “Nightly” and MSNBC set would have been much more sleek. It’s also interesting to note that, at least in the online version, the first few minutes were in 4:3 (as you can see with the letterboxing above) with the segment abruptly switching to 16:9 a little in to it.